A handwritten letter in which Albert Einstein wrote his personal feelings on the existence of G-d and his opinions on religion, unconnected with his scientific theories, is going up for sale on eBay this month with bids starting at $3 million, auction agency Auction Cause has announced. The so-called "G-d letter," which was written in German a year before Einstein’s death in 1955, includes the scientist’s thoughts on religion, the Bible and the concept of G-d. 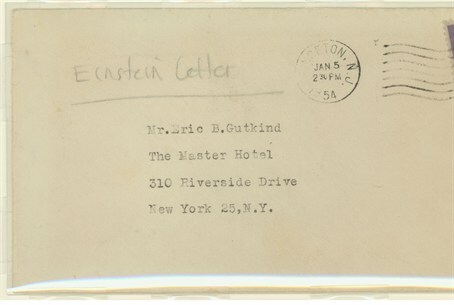 The letter, written on Princeton University letterhead, is addressed to philosopher Erik Gutkind, after Einstein read Gutkind's book titked "Choose Life: The Biblical Call to Revolt." "...The word G-d is for me nothing more than the expression and product of human weaknesses, the Bible a collection of honorable, but still primitive legends which are nevertheless pretty childish. No interpretation, no matter how subtle, can (for me) change this," Einstein wrote. "For me the Jewish religion like all other religions is an incarnation of the most childish superstitions," the letter continues. "And the Jewish people to whom I gladly belong and with whose mentality I have a deep affinity have no different quality for me than all other people. As far as my experience goes, they are also no better than other human groups, although they are protected from the worst cancers by a lack of power. Otherwise I cannot see anything 'chosen' about them." "With friendly thanks and best wishes, Yours, A. Einstein," it concludes. The letter, which is being stored in a temperature-controlled vault, had previously been sold to Eric Gazin, president of Los Angeles-based Auction Cause, for $404,000—three times the pre-auction estimate. "Few people have had access to the thoughts and uncensored opinions of this brilliant mind as it relates to his personal views on G-d and religion," Gazin said, according to Fox News. Einstein experts say the letter supports the argument that the physicist held complex, agnostic views on religion. Yet, while he rejected organized faith, he often spoke of a spiritual force at work in the universe. Einstein, whose theory of relativity changed the face of science, won the Nobel Prize in Physics in 1921. Born in Germany, he was abroad when Hitler came to power in 1933 and did not return there, settling in the United States instead where his discoveries led to the creation of the first atom bomb..